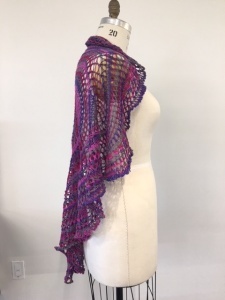 When I made the first circular shawl, I varied the shape of it by using short rows to create the extensions over the shoulders to allow it to be tied. 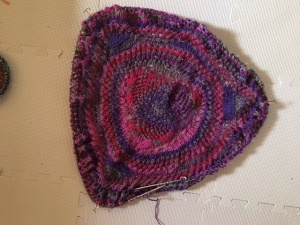 Short rows were the key to altering the shape of the basic circle in interesting ways. I made simple triangles, squares, hexagons and also rather abstract irregular shapes using short rows. Also, the short rows allowed me to isolate or group colors that occurred in the repeating color changes of the various yarns I used. This was a first effort using a Paton Kroy Sock yarn (75% washable wool, 25% Nylon) in the “Blue Striped Ragg” color. 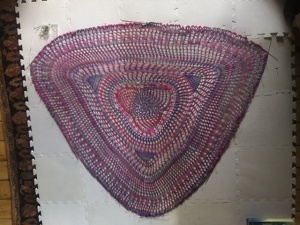 I started with the basic circular pattern, using extra knit rounds between the pattern rows to break up the spiral, then, when at about 256 stitches, I divided the work into three roughly equal parts (85/85/86 stitches) on three separate needles, and worked short rows over each section. I did this by knitting/purling back and forth, decreasing the number of stitches in each row by making the turn one stitch short of the previous turn each time until one or two stitches remained in the short row, then knitted along the edge of the triangle just finished over to the next section, where I repeated the process. This created a triangular shaped piece. Also, the short rows resulted in isolated grouping of the colors as you can see in the photo. 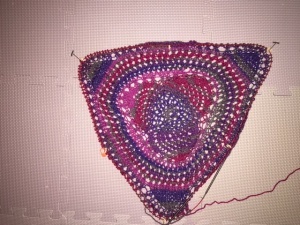 At this point, the shawl could be finished off by simply knitting around the perimeter using whatever variation of the pattern you like. Remembering to make increases when needed. When to make the increases is a matter of judgement, as there is no longer the regular repeats of the circular pattern due to the irregular shape. The best advice would be to make the increases, by doubling the number of stitches when ever you think it might be needed to keep the piece flat and relaxed. It is always better, and easier to block, if there are too many stitches rather than too few. In the shawl pictured, however, I decided to use short rows to continue to make small blocks of solid colors as I worked around the perimeter of the piece. The technique is simply to knit along in whatever pattern you are working until you get a solid color, then work a bit in that color before switching direction and using short rows back and forth until the color changes again. Working in this manner will give you the opportunity to play around and make patterns as abstract as you may like. I also did some short runs of stitch increases and additional short rows over the points of the triangle to keep the shape very sharp and maintain the acute angles of the corners. This is a fun exercise in adapting your knitting pattern to the color changes of the yarn you are using. The possibilities are endless, and each piece unique. 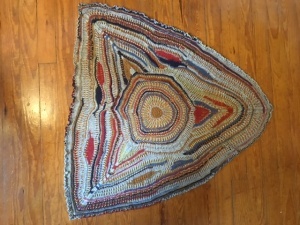 Here is another triangular shawl early on. You can see that I have continued the basic yarn-over-knit-2-together pattern into the three triangular short row shapes to maintain the spiral look of the piece. The basic three points of the pattern are now established. I added two stitches to the 256 stitches of the basic circle (258 sts) so the three points would have equal number of stitches (86). The piece is also now on a single 60″ circular needle with markers placed at the points where the three sections join. Here the same piece is, farther along. 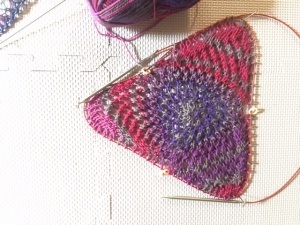 I have added some additional short rows to keep the shape “point-y” as the diameter increases. And another shot of the work in progress. As you can see, it is outgrowing the single 60″ needle. At this point I will add another one or likely two 60″ needles so I can periodically stretch the piece out to monitor the shape of it as it progresses. Once I finish another piece in progress, which has three 60″ needles in it and the needles are available. 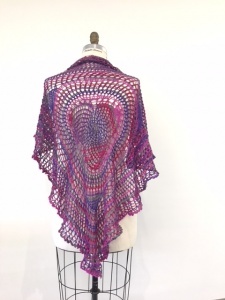 The yarn for this shawl is Patons Kroy Socks yarn, color Purple Haze. At this point, I am into the second 50 gram ball, and will use a total of about 150 grams. And here it is on a manikin.